New Jerusalem is the mingling of the Triune God and His chosen, redeemed, regenerated, and matured people. Around New Jerusalem on the new earth are the peoples (Rev. 21:3), the nations (Rev. 21:24). * The [nations] will be judged by Christ at the throne of His glory when He comes back to earth….The justified ones, the “sheep,” will be blessed and will inherit the kingdom prepared for them from the foundation of the world (Matt. 25:31-46). Unlike the New Testament believers, the “sheep” will not be saved and regenerated; they will only be restored to the original state of man as he was created by God….After the millennial kingdom, a part of these nations, deceived by the devil, will rebel against the Lord and will be consumed by fire from heaven (20:7-9). The rest will be transferred to the new earth to be the nations, which will live around the New Jerusalem and walk by its light….They, as created but unregenerated men, will be maintained to live forever in their created state through the healing of the leaves of the tree of life (22:2). Even for them there will be no more death (v. 4). Under the shining of the New Jerusalem with the divine glory, neither will they be in darkness. The peoples are restored but not regenerated. They belong to God but they are not His sons born of His life. Hence they cannot participate in the oneness of New Jerusalem. First Corinthians 2:6-13 speaks of the things which God prepared “before the ages” for those who love Him, those who are born of the Spirit. The timing of this preparation is different from the blessing “prepared for you [the sheep] from the foundation of the world” (Matt. 25:34). This shows another distinction between those who are constituents of New Jerusalem and those who are around New Jerusalem. Thank the Lord that the door is open today to receive Him as life to become part of New Jerusalem! * Note 1 on Rev. 21:24 in The Holy Bible, Rec. Version published and © by Living Stream Ministry. New Jerusalem is the mingling of God with His chosen, redeemed, regenerated, and matured people. The city is this organic union of God and His people. Around the city are the peoples (Rev. 21:3), the nations (Rev. 21:24). These peoples/nations are not New Jerusalem because they, being plural, do not have the oneness of New Jerusalem. * The “peoples” in this verse will be “the nations” in verse 24. There will be several peoples, and each corporate people will be a nation on the new earth. These nations which will surround the New Jerusalem will be restored, but they will not be regenerated….As the restored and purged nations, they will live outside the New Jerusalem and they will enjoy the common blessings in the new heaven and the new earth. These peoples will be God’s peoples, belonging to Him. However, they are not His sons born of His life. Without this life they cannot participate in the oneness of New Jerusalem. These peoples enjoy the blessings of the new earth but do not partake of the special blessings in New Jerusalem. For example, the peoples/nations will not eat the fruit of the tree of life (Christ). Their portion will only be the healing of the leaves of the tree of life (Rev. 22:2). They will receive this blessing out of New Jerusalem, but it is far better to partake of Christ as our tree of life both today and in New Jerusalem. * An excerpt from Life-study of Revelation, message 58, by Witness Lee, published and © by Living Stream Ministry. This and many other books by Witness Lee may be read online here. In John 15:4 the Lord Jesus tells us, “Abide in Me and I in you.” This abiding is in the divine life and is portrayed in John 15 by the vine and the branches. This mutual abiding will continue unto New Jerusalem. As soon as we receive Him, Jesus Christ is in us. While this fact remains true eternally, “in” is only a starting point. Galatians has the progression of Christ revealed in me (1:16), Christ living in me (2:20), and Christ formed in me (4:19). This is equivalent to Christ making His home in our hearts (Eph. 3:16-17). 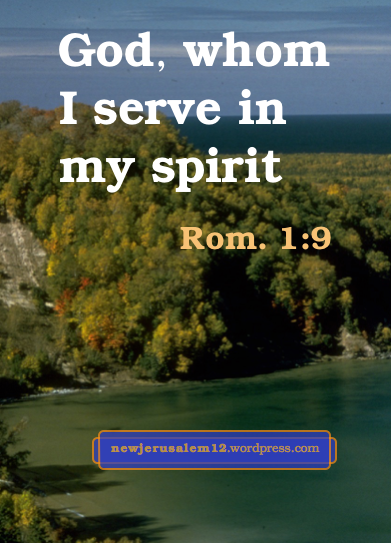 Christ being formed in me and making home in me is a blending of Him and me, and is for New Jerusalem. This blending takes place as Christ lives in me and I live depending on Him by faith (Gal. 2:20). We either open to the Lord or hinder the Lord. We can pray what is in the quote above or open to the Lord’s desire with our own words. 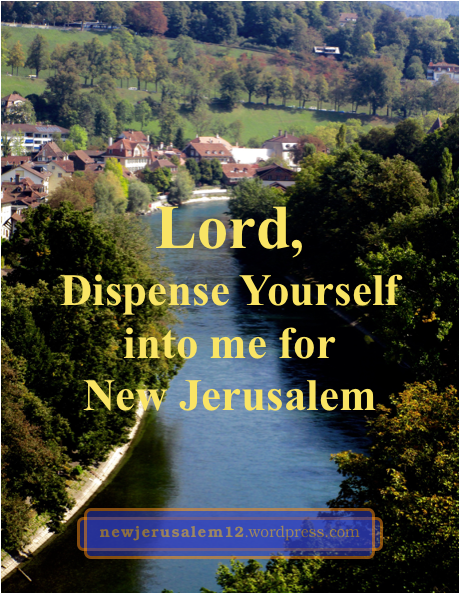 Lord, impart Yourself into me for New Jerusalem. 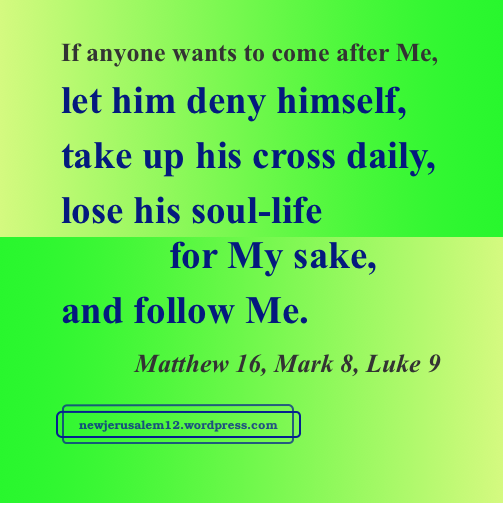 Lord Jesus, mingle Yourself with me, be formed in me for New Jerusalem.